Looking back at the January market, as of January 31, the Shanghai Composite Index closed at 2,584.57 points, with a cumulative monthly increase of 3.64%. 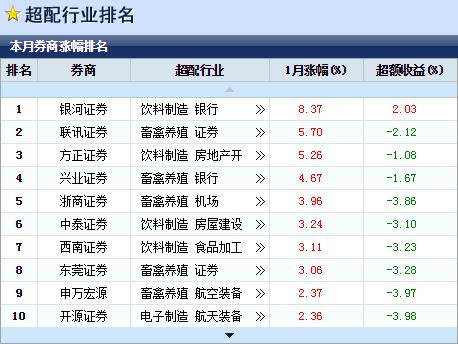 The cumulative monthly increase of the Shenzhen Component Index and the GEM was 3.31% and -1.8%. Comparing the growth and decline of the major indices of the broader market in January, the Shanghai and Shenzhen 300 gained the most, with a cumulative monthly increase of 6.34%. From the perspective of Shenwan's first-class industry, 28 industries accounted for half of the increase and decrease in January, among which the household appliance industry rose sharply, with a cumulative monthly increase of 13.06%, and the food and beverage industry accumulated 9.72% monthly, followed by The cumulative monthly increase in the non-bank financial industry and the banking industry was 8.81% and 8.24%, respectively. In the financial industry, "Guangyan" monthly over-match industry selection, a total of 21 brokers participated in January. According to industry statistics compiled by various brokers, the top three winners in January were: Galaxy Securities, Lianxun Securities,Founder Securities. As can be seen from the table, the top three brokers in this list have a large gap. The number one Galaxy securities industry is equipped with three industries, namely beverage manufacturing, banking and food processing. Due to the precision of the food and beverage and banking industry, it leads the second place with 2.67%, and the total score has opened a large distance. 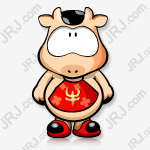 The second-ranked Lianxun Securities recommended four industries in January: livestock and poultry farming, securities, oil exploration, aviation equipment, livestock and poultry farming and the securities industry rose by 8 percentage points, compared with the first two oil exploration and aviation equipment. The growth rate of the industry was relatively low, but the oil extraction and aviation equipment industries were not much different, and the overall results were not affected. Founder Securities has deployed three industries, namely beverage manufacturing, real estate development and communication equipment. Although it has set foot in the beverage manufacturing industry, the growth of the configured communication equipment industry has been negative, which has lowered the total score ranking, making it the third. Galaxy Securities: In the industry configuration, it is recommended to configure mid-stream home appliances, automobiles, military, and downstream medicine. Recently, we have clearly defined the year-round configuration ideas “new infrastructure, post-real estate, medical military work hedging, looking for structural opportunities in the sub-sectors”. Combined with the current industry boom, we are optimistic about home appliances and automobiles in the post-real estate cycle, which is expected to be the main beneficiary of the steady growth policy. As a profit counter-cyclical industry, military industry and medicine can be used to hedge the downside risks of the economy. The key variables of the two are military orders and medical reform promotion speed. At present, the government is potentially adding leverage. The prosperity of food and beverage has been digested by the market. After the peak season, there is a certain uncertainty in demand. It is recommended to wait and see. The relationship between banks and the real economy is the closest. The recent improvement in liquidity will bring about the valuation repair. It is necessary to observe the performance of the real economy if the follow-up can continue. Lianxun Securities: Specifically, value blue chip stocks we recommend large financial and durable goods consumption. First, the science and technology board is expected to accelerate the landing, nearly 100 billion IPO and related services, is good for brokers, this main line we have continued to recommend since the bottom of the market on October 19 last year. Second, the central bank introduced the central bank bill swap tool (CBS), which is conducive to banks to replenish capital, promote credit, and boost the undervalued banks. Third, the National Development and Reform Commission is about to launch a policy to stimulate the consumption of durable goods such as home appliances and automobiles. The short-term performance elasticity of these two sectors has increased, and it is relatively underestimated, and the margin of safety is large. In terms of the theme investment, the participation of the theme investment has greatly improved in the context of the improvement of risk appetite. We mainly recommend the four sustainable direction of Venture Capital, Xiong'an New District, 5G, Guangdong, Hong Kong and Macau. Industrial Securities: Pay attention to the opportunity of "Four Great King Kong" (big brokerage / big innovation / big infrastructure / big country owned housing). Large brokerage: Science and Technology board + registration system pilot. Great innovation: high-quality development + modern service industry integration + domestic strong market +5G, industrial Internet, Internet of Things and other "To B" chain. Big infrastructure: local government special debt + stable total demand. Large countries have housing enterprises: housing does not fry + due to city policy + classification guidance. Theme investment: tax reduction and fee reduction, integration of the Yangtze River Delta, railways and other mixed ownership reforms. Financial eyeBest analyst selectionFinancial portalThe financial industry website, creating an exclusive quantitative selection model in the industry, bringing together the most comprehensive mainstream brokers, thousands of industry analysts, and hundreds of strategists, not only makes the strength of analysts stand out, but also taps potential investment opportunities for you. ! Galaxy Securities Week Strategy: There is still room for rebound. The market is expected to fluctuate upward.